Note: This Image is from the Montgomery County Historical Archive Transcript as it closer to the original I have left those images but sourced the Kinship version since I own it and have full time access to it. There is some difference in the marriage year: 1) The Brookman Family Tree has 1814 which makes more since since there first child was born in 1817 but 2) The Church Records state 1818 and since they are vital records I have choosen to use that until I can find more proof for the other. [S00120] 1850 United States Federal Census, Images reproduced by FamilySearch, (Ancestry.com Operations, Inc., 2009), [database online]., Stark, Herkimer, New York (Page 8 of 40). [S00121] 1860 United States Federal Census, Images reproduced by FamilySearch, (Ancestry.com Operations, Inc., 2009), [database online]., Stark, Herkimer, New York (Page 29 pf 39). [S00110] 1870 United States Federal Census, Images reproduced by FamilySearch, (Ancestry.com Operations, Inc., 2009), [database online]., Stark, Herkimer, New York (Page 15 of 39). 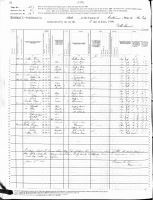 [S3922814043] New York State Census, 1892, Ancestry.com, (Ancestry.com Operations, Inc., 2012), [database online]., ED 1, Stark, Herkimer, New York (Page 2 of 5). [S3922814016] MINDEN, Baptism Record of Saint Paul's Lutheran Church in the Town of, Transcribed and Indexed by Arthur C. M. Kelly, (Kinship, 305 Cedar Heights Road, Rhinebeck, NY 12572), 255. [S3922814016] MINDEN, Baptism Record of Saint Paul's Lutheran Church in the Town of, Transcribed and Indexed by Arthur C. M. Kelly, (Kinship, 305 Cedar Heights Road, Rhinebeck, NY 12572), Page 157, Item 3281. [S3922814008] Obituary Personal Collection, The Richfield Mercury, Page 1, 26 Jan 1899. [S00027] FORT PLAIN, Records of the Dutch Reformed Church of, (Montgomery County Department of History and Archive), 75.